This year is the 80th anniversary of the Kindertransport, the scheme that welcomed 10,000 child refugees to Britain in the shadow of the Second World War. 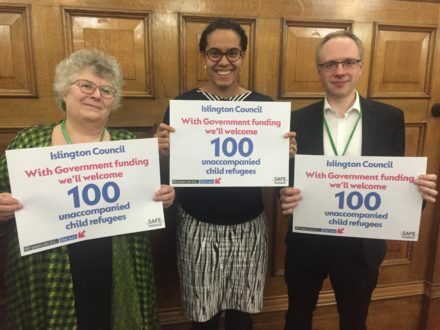 In that spirit, we are delighted that Islington Council has pledged to support the Our Turn campaign, and welcome a further 100 unaccompanied child refugees to Islington over 10 years. This pledge was made in part after a passionate representation from pupils at Hugh Myddelton Primary School at our last council meeting. It was incredibly touching to hear the eloquent speeches of Islington children in support of our borough as a welcoming and inclusive place to live. Growing up in Islington is to grow up in a richly diverse community, and it is clear that our young people are very proud to be part of it. The Our Turn Campaign – supported by the refugee charity Safe Passage, and led by Lord Alf Dubs – calls for the establishment of a new ‘Children at Risk’ resettlement scheme to bring 10,000 child refugees to the UK over the next 10 years. At a recent Kindertransport commemoration event hosted by Safe Passage, we celebrated the local authorities taking a stand and welcoming refugees in need of a safe place to call home – no local authority has pledged to welcome more unaccompanied child refugees than Islington. Labour in local government are leading the way in providing a safe and welcoming home to refugees. Labour-led councils up and down the country are pledging to welcome refugees from all over the world, and asking the government to provide the financial support they need. The government has so far failed to confirm the continuation of the Vulnerable Persons Resettlement Scheme (VPRS) and Vulnerable Children Resettlement Scheme (VCRS) beyond 2020, and we think this is unacceptable. In a cynical move, the government is claiming that local authorities are not willing to welcome refugees into their communities. By signing up to the Our Turn Campaign, we are making clear that Islington would gladly welcome child refugees were the government to confirm resettlement funding. Islington recently welcomed our 15th Syrian family to Islington under the current Vulnerable Persons Resettlement Scheme (VPRS). We are the only local authority with a Migrants Champion dedicated to championing the issues that matter to migrants and refugees, and ensuring their voices are heard. In our bold 2018 local election manifesto, Islington Labour pledged to continue to welcome people fleeing persecution and conflict, including unaccompanied asylum seeking children, ensuring that services are in place to help them build new and fulfilling lives as part of our inclusive community. We are proud to be fulfilling another of our manifesto pledges with our promise to resettle 100 unaccompanied child refugees in our borough. While the government continues to foster a hostile environment for migrants and refugees, Islington is an example of a Labour-led council putting our values into action in local government. A Labour government in Westminster also would do things very differently – ending the hostile environment and honouring the spirit of international law, and our moral obligations, to welcome refugees forced from their homes by war, famine or other disasters. The residents we represent are from every community you can imagine, from the Irish immigrants who moved to Islington to build railways in the 1800s and the Caribbean Windrush generation in the 1940s, to Syrian refugees fleeing conflict and violence today. Our borough has historically welcomed people from all over the world, and we are so proud to be continuing that tradition today. As Islington Labour councillors, we will continue to stand up for everyone in our communities, and to champion Islington as a welcoming home for migrants and refugees. Cllr Kaya Comer-Schwartz is executive member for community development and Cllr Sue Lukes is Islington Council’s Migrants Champion.